While you and I cleaned out the pool, braved NorthPark Mall in Dallas, or invited friends over for BBQ and margaritas, the rich and famous played quietly at their second homes. I mean, who got this whole second home fad started anyhow –celebrities and the very wealthy. William Randolph Hearst built his Hearst Castle in San Simeon with 41 bedrooms so he could invite friends. I mean, what fun is 95,000 square feet if you live there alone and can’t fill it up? 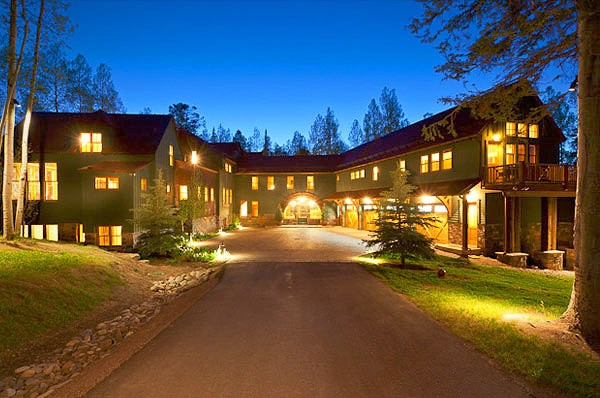 In Telluride, Colorado where Seinfeld has his second home mansion, the home is often filled with friends. Others, however, like to take to the beach for a quiet get away with loved ones. Of course, Dallas quarterback and newlywed Tony Romo tried that this summer — at Sean Payton’s Watercolor, Florida beach house — and ended up playing football on the beach. This gorgeous ocean-front home is done as a Balinese-styled getaway on already celebrity-studded Broad Beach. If you cannot afford the $14.75 million asking price, never fear. You can lease it for a mere $95,000 a month. Wait — just read that the monthly rental has been chopped to $80,000. Wow, that’s way more affordable. The 4300 square foot home was extensively renovated in 2005. Here’s an idea: share between three couples. After all, the home includes three suites (the master bath is more special with a Chinese onyx spa-inspired bath), a Creston media room, a designer kitchen, plus a guest house with meditation or guest room, and a workout room. 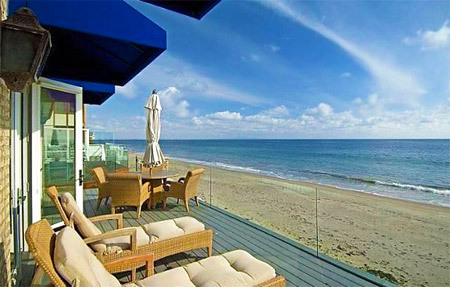 But really, no matter the holiday, what better place to be than Malibu? Kelsey Grammer, the former “Cheers” TV show star, is selling his enormous mountain ski retreat that was once proudly featured in Architectural Digest. Grammer had only skied about two years when he bought the house, located in between Glenwood Springs and Breckenridge. But who cares about powder conditions when you have a wine cellar, stone flooring, vaulted ceilings, nanny quarters, deck and well, this house? The structure’s building materials are recycled and have an intriguing history. The hardwood was salvaged from an 18th-century Chicago warehouse. Now here’s something we just cannot believe: according to Internet gossip, Stewart is not fond of tresspassers and supposedly has the stones on Skylands’ pink granite drive annually removed, washed, and then replaced. Why not just let the ocean shower them with saltwater? 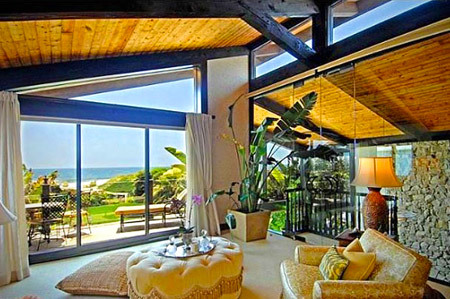 The Osbournes bought this seaside home in 2003 for $5.1 million. 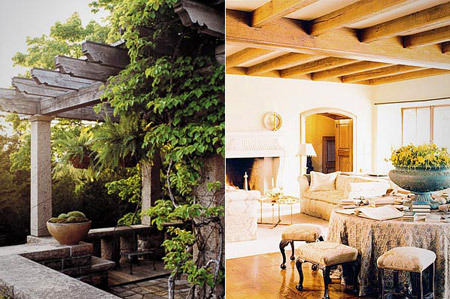 We hear that Ozzy and Sharon Osbourne have been shedding real estate lately, such as the home featured on their reality series— which was later sold to Christina Aguilera—and also their main residence, a mansion in Hidden Hills, Calif. Sadly, the Osbournes have also been trying to sell or rent out a gorgeous midcentury beachfront home for years. The rent has varied from $25,000 and $40,000, that’s per month. The home is loaded and features a library, walk-in closets, security features naturally, plus numerous beachfront decks and terraces. 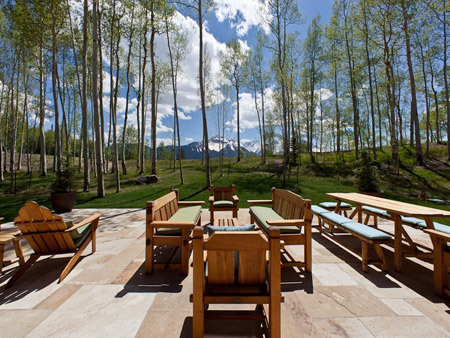 Comedian Jerry Seinfeld’s massive Telluride, Colo., compound, with 27 acres overlooking Sunshine & Wilson peaks, is on the market fully furnished, often the case with second homes, is being offered fully furnished. The mansion was completely renovated circa-1991 and includes a wet bar, lofts, and a huge guesthouse. But the sweet spot is truly the outdoors. If you can visualize a deck twice the size of most homes, that would be the 5,500-square-foot deck. Talk about great entertaining. The property also includes hiking trails and a creek, and is of course located smack near some of the best skiing in the state of Colorado. More North Texas real estate news. The coach of the New Orleans Saints is not leaving the Saints to join the Cowboys, but he is moving his family to Vaquero, in Westlake, from New Orleans, according to The Times-Picayune. Sean Peyton apparently has bought (or plans to buy) a home and plans to enroll his children in school in their new Texas neighborhood toote suite. According to ESPN, Payton became interested in Vaquero when he lived in nearby Southlake, during his tenure as an assistant coach under Bill Parcells with the Cowboys. Tom Benson insisted on the entire Payton family living in New Orleans. Well, all that is changing. Oh and the Payton’s have a second home on the Gulf Coast in Watercolor, Florida, one of my very favorite second home haunts. (See photo of the house.) Moved in Memorial Day, 2009. I can tell you this: Tony Romo will probably not be taking his fiance, Candice Crawford, to this beach bungalow, like he did Jessica Simpson in 2009. The locals say she was clomping all over the Boardwalk in her four-inch stilettos. Next up: which Vaquero home is he buying. I swear, Vaquero: Home of the Sports Superstars. Or maybe, TMT: Too Much Testosterone. Forbes listed it as the most affluent neighborhood in the entire country!